The removal of the message is very simple. 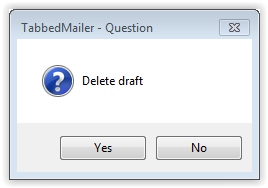 Will be enough on the menu File to select the option Messages. Then to go on the tuck which interests us. To mark the message across the single click and to select with the menu on left side the option Delete message. The program will ask us whether surely we want to remove the message. We click on the button Yes.